How do I apply Wall Murals (Sticky textiles (A))? This web-page will teach you how to apply your own bespoke wall murals (sticky textile). See our written instructions and instruction videos below. Your custom wall mural (sticky textile (A)) will arrive in a sturdy box. Ready for you to apply, your own unique bespoke wall mural to your wall/mounting-surface. No tools required. Always, first read, our extensive general information here, before your start the application/installation of your custom wall mural (sticky textile (A)). 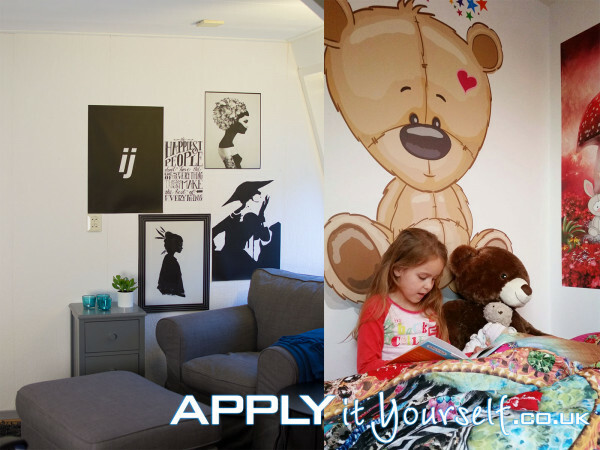 Below you find the application instructions on how to apply your own bespoke wall murals (sticky textiles (A)). Always keep your custom wall mural (sticky textile) flat so they do not bend/fold, to avoid creases. Make sure to not apply your sticky textiles in direct sunlight, make sure the temperature of the mural, the wall/mounting-surface itself and the surrounding air, is -ideally- around 12 to 18 degrees Celsius. When the temperature is above 18 degrees, we advise you to wait. Extensively clean the wall/mounting-surface. Remove paint, grease and other dirt. This is extremely important, walls collect a lot of dirt over the years, and/or during renovation/DIY projects. Also be sure that the paint on your wall has sufficiently dried. Wait at least 2 to 3 weeks before installing large wall murals onto freshly painted walls. All water and solvents must have evaporated before installation. Also clean the surrounding area. If you are applying you wall mural near the ceiling and/or the ground make sure they are also clean. Also be wear of flying insects and roaming pets. Lock up your pets. Put your mural on a large flat table with the backing paper facing up. 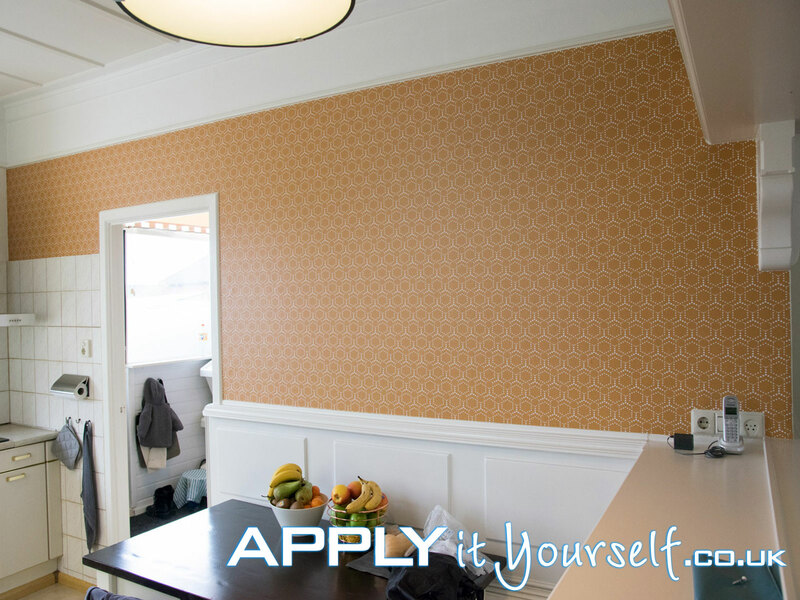 Carefully, remove the backing paper from your mural. 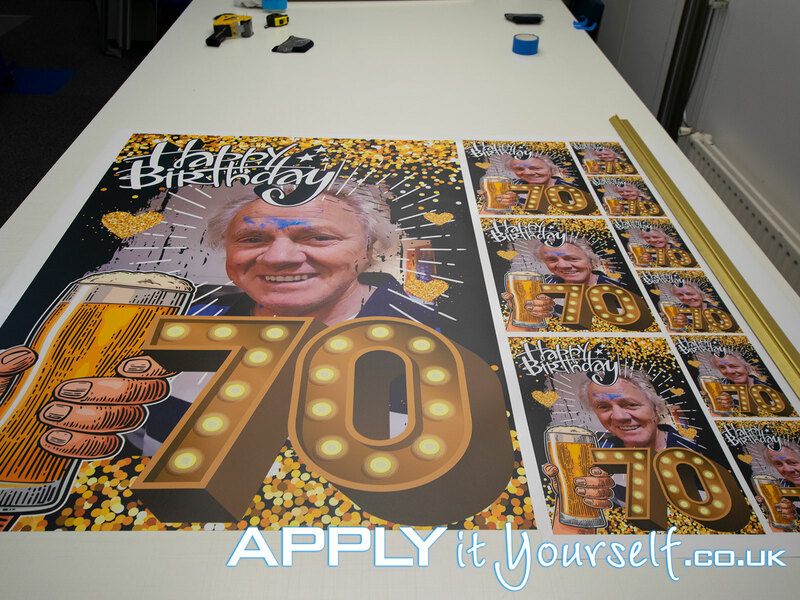 When your bespoke wall mural contains cut-outs/elements, be very careful when removing the backing paper, as to not tear the film itself, when parts of the wall mural remain stuck to the backing paper. Take your time, most mistakes occur here! Position your bespoke sticky textile (wall mural) at the preferred location and apply your wall mural to the wall/mounting-surface. You may want to use 2 or more people for this. Especially if you are applying large wall murals. One person using using his or her hands to apply the mural to the wall and one or two other people holding the ends of your bespoke wall mural. Start in the middle/centre of the wall mural and move your hands horizontal (or vertical for long vertical wall murals) with overlapping movements towards the edge of the mural. During which you hold the wall mural a couple centimetres (2 inches) above the wall/mounting-surface itself. Photos of Custom Wall Murals (Sticky textile (A)). Below you will find a number of photos of custom wall murals (sticky textile (A)) before and after they have been applied.